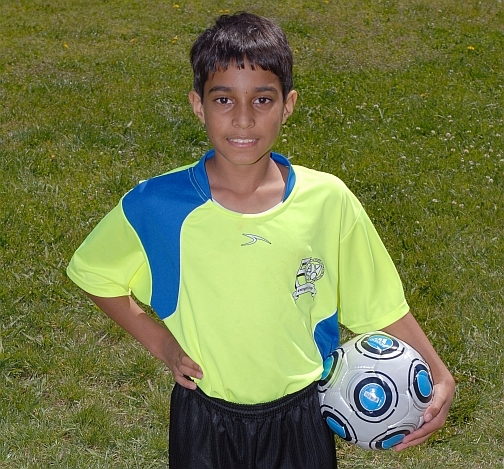 IMACS student Shiva Oswal is ready for his soccer match. I’ll be turning 11 soon, and I love the EMF courses! As a history buff, I really enjoy reading about decisive battles in world history. I also like playing board games and computer games. Right now my favorite board game is Robo Rally, and my favorite computer game is Castle Empire. On the weekends, I participate in Live Action Role-Playing (LARP) events. Soccer is another activity I enjoy. My favorite position is goalie. You’ve done some amazing things already at a young age. Tell us about the accomplishments of which you are most proud. This year, I scored 24 out of 25 to earn a gold pin in the Mathematical Olympiads for Elementary and Middle Schools (MOEMS), and was named MOEMS “Mathlete of the Year” for my geographic region. I also invented a new board game called “Minetrap”. I am currently working on publishing my game. If you would like updates, email me at shivarasul [at] gmail [dot] com. Finally, I completed the first seven EMF courses and am almost finished with the eighth course. I am excited to start the ninth course, Number Theory soon. When I was in preschool, I was doing multiplication. When math in regular school became too easy, I decided to homeschool so I could work on challenging math problems and concepts. How did you become interested in taking EMF courses? My mom encouraged me to try the EMF courses, and I’ve been hooked ever since. What are the things you enjoy most about EMF? I like the way concepts are explained. The format of EMF courses, reading followed by exercises, helps check my understanding. The interactive tools such as The String Game make learning math fun. Also the point system (i.e., ability to level up based on mastery of material) makes EMF addictive. What are some ways in which your EMF experience has had a positive effect on your academic and non-academic pursuits? When I did my first EMF course, Operational Systems, I was very new to the field. I learned a great deal about operational systems and modular arithmetic after I completed this course. I have grown by leaps and bounds as an analytical thinker as EMF courses force me to think. The program has also helped me improve my skills at strategy games like chess. First and foremost, I would like to complete all 15 EMF courses. I hope to get to Calculus before I’m 13 years old. I am also working on becoming a professional soccer player. Thank you, Shiva, for sharing your story and congratulations on your amazing accomplishments! Discover why the Elements of Mathematics: Foundations program from IMACS is an excellent option for your mathematically talented middle-school-aged child. Half Price Holiday Sale: Try the first course, Operational Systems, at 50% off the regular price when you enroll on or before December 20, 2014. Bundled Savings: Save 25% on EMF Course Pack 9, which includes the first nine courses, when you enroll on or before December 20, 2014.